During July, our family (my wife and our son and daughter) spent three weeks traveling around Europe. My wife spent part of her childhood years in Germany and England, and the trip allowed our children to visit the homes in which their Mom grew up. The trip also allowed us to visit other places of significance. One of the highlights was our visit to the Augustinian Monastery in Erfurt where Martin Luther lived as a monk from 1505-1511. Luther entered the monastery following his promise to God if he were spared in a thunderstorm. Luther himself described his years at the monastery in Erfurt as the most important of his life. While in Erfurt, we worshipped with the congregation at St. Augustine’s Church. 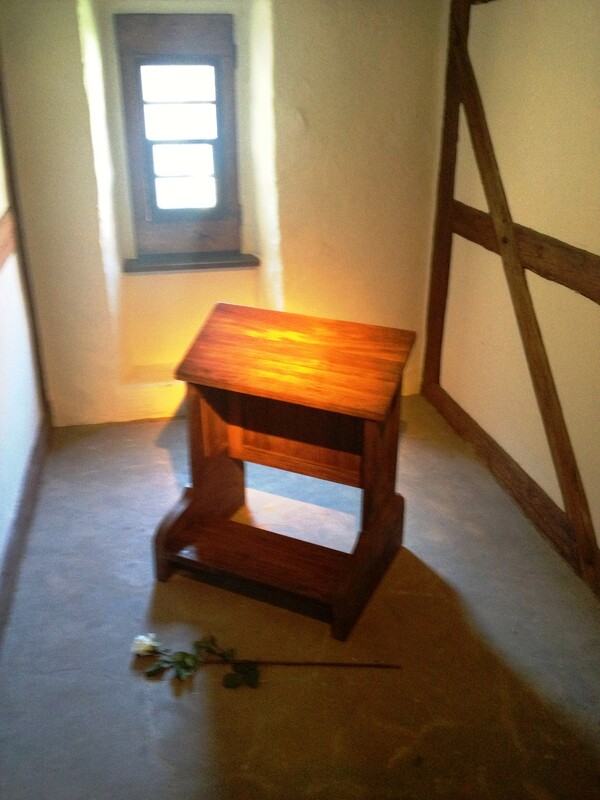 This church is where Luther, with trembling hands and trembling spirit, led his first Mass on May 2, 1507. We received the Eucharist at the same altar where Luther had been worship leader and where he had spent hours in meditation. It was deeply moving to join with faithful followers of Christ Jesus in a place so important to the development of Protestant Christianity. After worship, Dr. Irene Mildenberger, Pastor of the Church, graciously led our family on a tour of the monastery, including a stop at the cell in which Luther spent much time. As I followed the footsteps on Luther – from Erfurt to Wartburg Castle to Wittenburg – I was deeply grateful for Luther’s willingness to study Scripture and for his courage to have his conscience held captive to the Word of God. This entry was posted in Uncategorized on July 25, 2013 by Dean Allen.